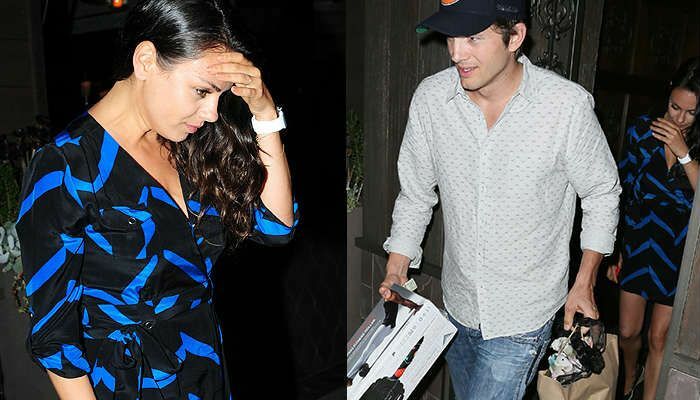 Mila Kunis and Ashton Kutcher are high on extended celebrations for the actress' birthday and it seems like she has even received an interesting gift from her newly-wed husband. The pair, who was spotted leaving West Hollywood hot spot Toca Madera after celebrating the 32-year-old actress' birthday in new York, dinned at the hotel for a romantic dinner but kept it low profile, E! Online reported. According to sources, the 'Ted' star, who wore a black and blue striped dress for the night, received a vibrating exercise roller as a gift from the 37-year-old actor. Kunis was seen laughing hysterically as she opened the gift and then she leaned in to give Kutcher a kiss after opening her gift, said sources.